I made some quiche for lunch yesterday, a change from noodles or dumplings. I cheated and used store-bought Pampas shortcrust pastry for the base. Actually, I wanted to cheat even more by buying the Pampas Savoury Flan, but they were all sold out at the supermarket. Hence, I decided to make small quiches. Heat the oven to 180C (160C for my oven). Grease the pie tins to ensure the pastry does not stick. Cut the shortcrust pastry to size and cover the base (ensure you cut the pastry slightly larger due to shrinkage). Prick the pastry with fork. Blind-bake the pastry in the oven for 10 minutes. Then remove from oven. In the meantime, fry the diced onions in a medium-size pan. When onions are transparent, add in the ham and fry till edges of ham are brown. Remove from heat. Break the eggs into a measuring jug. Season with salt and pepper, then add in the shredded gruyere cheese and cream. Spoon the onions and ham equally into the pie tins. Pour the egg mixture over. Bake in the oven for 20 minutes or until cooked through. Serve with mixed salad on the side. I love Quiche Lorraine too and I like to add bacon instead of ham. In my next bake I'll add ham like yours. 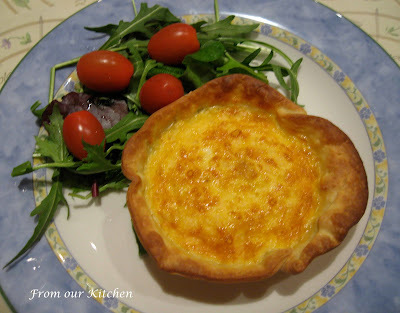 What a lovely presentation, Charmaine, the added touch of grape tomatoes add an elegance to the quiche. The main dish has well folded sides that hold the attractive baked colour inside - yummy to say the least. KY: Thank you for the compliments. Ashleigh loved the quiche. She had 1.5 serves, which is a LOT for her.